See scan - good condition. Shows some wear due to timing, but otherwise nice and rare piece. This is a nice and rare French Royal 1816 NAVY / Marine sterling silver medal / jeton. 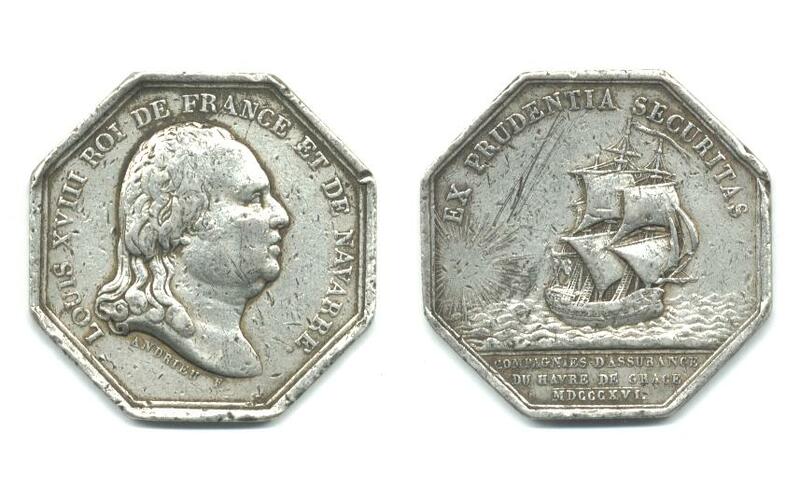 Obverse shows the bust portrait of Emperor / King Louis XVIII and text - LOUIS XVIII ROI DE FRANCE ET DE NAVARRE and obverse shows a nice ship with a sun shining ahead and text at top - EX PRUDENTIA SECURITAS nad text in smaller size at bottom saying - COMPAGNIES D'ASSURANCE DU HAVRE DE GRACE MDCCCXVI. Nice and rare militaria / military collector piece and one of the nice French medals.